From the last week, we've got space travel, mountain climbing, everyday travel, and body language tips. Read on for a Monday morning travel fix. The Viator Travelblog writes about the different ways people 'travel' day after day, week after week, year after year. In "Art of Travel: 7 Trips to New Worlds" there are some fascinating examples of different kinds of travel that don't necessarily involve air planes or trains. Travel Burner put together a roundup of spaceport plans around the world and when you can expect to book a trip into outer space. For all the options, read "Spaceports: Blasting Off Around the World". 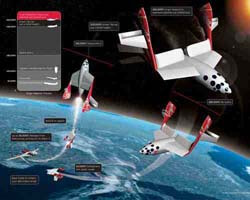 For more about space travel, we've covered Virgin Galactic's plans here at eyeflare.com in "See the northern lights up close and personal" and "Fancy a journey into space?" My Super-Charged Life writes about the reasons why he's in a travel rut, and what do to about it in "My Best Excuses for Remaining in a Rut". Worth a read, and if you're using the same excuses to avoid traveling, get off the computer and book something! Traveling Stories Magazine writes about climbing up Mount Kilimanjaro in "Chilly up Kili - climbing Mount Kilimanjaro". I'm still not convinced about climbing mountains, but it reads like it's quite the adventure. Upgrade: Travel Better covered how "Canada prohibits airlines from charging overweight passengers for an extra seat" a while back. I'm all for charging passengers that can't fit in one seat for two tickets, as they're using the space, but others disagree. Share your viewpoint in the comments below: Should oversize passengers be charged extra? Not much to do with travel, but plenty to do with people, these "25 Examples of Body Language" are a good primer to figure out the people you come across everyday - and their intentions. In "Everything you know about absinthe is wrong", Salon busts the myths surrounding Absinthe. We've written about Absinthe before but the Salon article goes into much more depth. Read it to find out more than you ever really wanted to know about this mythical drink. A Men's Health article outlines how to "Shop Once, Eat for a Week", and it has some great tips about buying groceries and cooking quick, easy, and healthy food from those groceries. It's a really useful shopping list, and I try to use this as a guide for my own eating. Kayaking is adventure eco-travel for everyone. For the environmentally aware adventure traveler, kayaking is a great option either as a vacation theme or a day's activity. Hotel fire safety - your steps for surviving. A guest post from Matt Keegan, these tips on getting out alive are definitely worth a second look. NewYorkology.com - a great New York resource. NewYorkology is probably the most comprehensive site to find out what's on in New York. Click through to get the 411. Visit Kauai for the outdoors. The Hawaiian island of Kauai is an outdoor paradise. This article is a quick overview of what you can experience on your vacation to Hawaii. If you have any more great articles to share, leave a comment with the URL below. Last updated by jack on 20 July, 2014 in Reading.